An international wastewater instrumentation manufacturer is now using peristaltic pumps from Verderflex as part of the wastewater sampler systems it manufactures. The pumps provide reliable and accurate performance which helps the Hydrocell sampler systems produced by Halifax-based Smart Storm to measure the volume and toxicity of wastewater effluent. As a leading provider of water and wastewater equipment, Smart Storm needed a pumping solution which offered reliability, accuracy and the ability to lift trade effluent up to 7 meters, prior to it being measured and analysed, without a secondary pump being required. 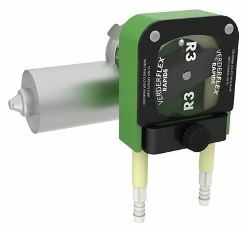 The company chose Verderflex R3DC OEM peristaltic pumps to fit the bill, as these compact, easy-to-maintain pumps combine the required performance with a proven track record gained in a wide variety of industrial waste applications. In 2013 Smart Storm embarked on a design exercise to replace their existing waste water sampler with a new state of the art product that would meet the harsh demands of industrial waste water sampling. The new product, known as the Hydrocell sampler, included the Universal Smart Instrument (USI) as its instrument controller which offers the only waste water sampler on the market with a graphical user friendly interface and Windows CE programming.